Pemba Lama is an ex-Gurkha soldier, chef for the British army and the author of The Ultimate Nepalese Cook Book. The book is very close to Pemba Lama’s heart, as a £2 donation goes to the Gurkha Welfare Trust for every copy sold. Pemba recently cooked at a luncheon for the Dalai Lama, during his tour of the UK, for which he presented a predominantly vegetarian menu of dishes from his cook book. He was honoured when the Dalai Lamai signed a copy of the book; it’s very rare for him to do so. A preview of the book, including several of the recipes included, can be found at the dedicated website. I asked my mum, Mamta, to review the book, as she’s familiar with Nepalese cuisine, and of course, with Indian, which has much in common with it. When Kavita asked me to review this book my first thought was, “I am going to enjoy this”, because I had very fond memories of Nepalese food from our trip there a few years back. When I opened the book and saw Pemba Lama’s picture on the inside sleeve, with such a gentle expression on his face as he handled the food, that view was strengthened. Not good enough reasons? Well that is what first impressions are about! Nepalese food is very similar to Indian food and the recipes seemed very familiar to me, only they had slightly different names. My husband just had some dental work done, so I thought this would be perfect and it seemed so simple to cook. The end result did not disappoint me, it was gently garlicky and tasted delicious; it was superb! I have made it again for friends and they have all liked it. The recipe gives only 400 ml of tomato juice for 300 grams of rice. 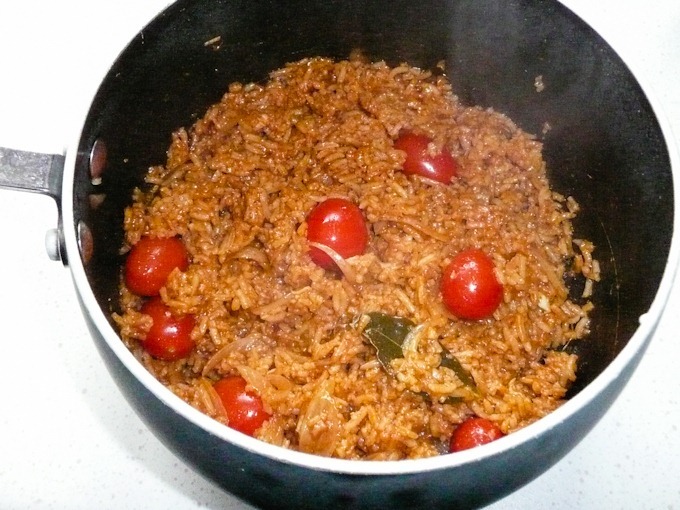 Most recipes give double the amount of liquid to rice, perhaps a little less when the rice has been pre-soaked. I added water to increase the total liquid, and that worked fine. 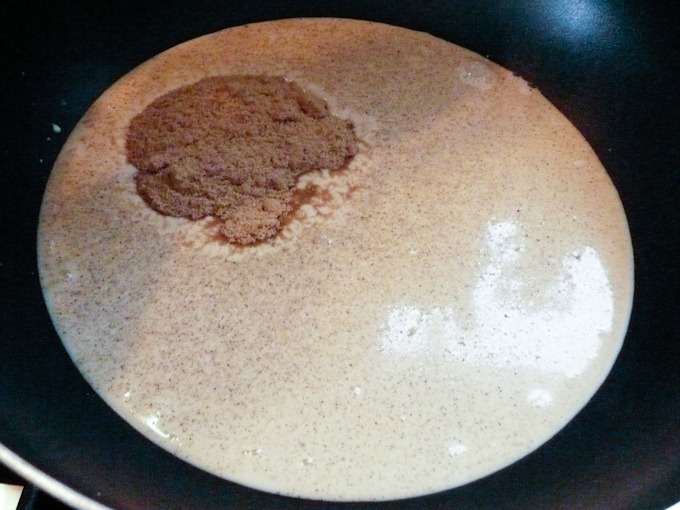 The picture at the top right of the page shows a hand adding what look like nigella seeds to the pan but they are not listed in hte ingredients. Perhaps the picture is for some other recipe. This is a recipe I will make regularly. Next I tried a favourite of the English nation – Pyazis. 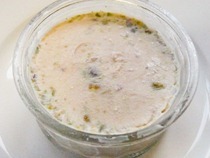 This recipe can be found online, here. 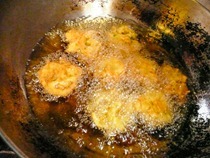 Marinating onions in vinegar and salt for bhajis is new to me, but it worked and tasted pretty good. 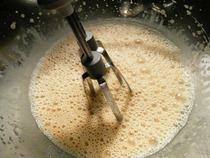 Making the batter required a couple of tablespoons of extra water, which was not listed in the ingredients or given in the steps. 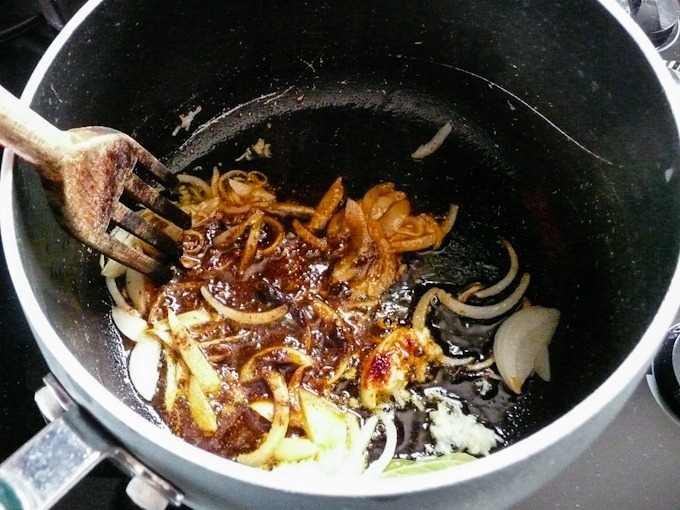 The vinegar, in which the onions were marinated, wasn’t enough liquid to make a batter. 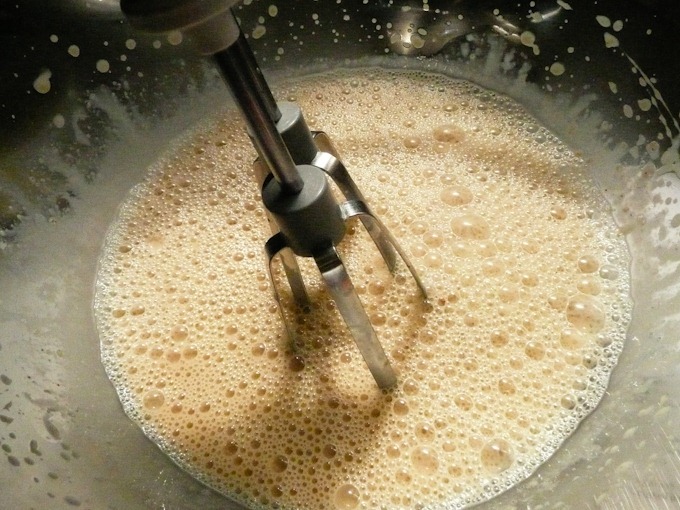 The book says ‘soft and thick batter’ but I’m not sure quite what that means. It was not a problem for me because I am used to making onion bhajis but a first timer might not know what the batter should be like. These were simple to make and quite tasty. A neighbour dropped in while I was making them and loved them. 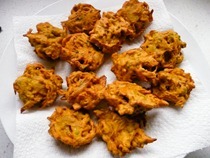 One personal observation from a regular onion bhaji maker: the bhajis could have been lighter and crisper, perhaps a pinch of baking powder is needed in the batter? 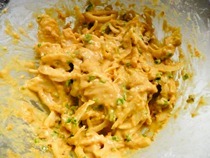 I followed the recipe carefully, as it is a little different to mine, both in ingredients and the order of the recipe. I didn’t add any potatoes as they are listed as optional; I didn’t have any in the basket and was feeling too lazy to go out and dig some! The picture in the book also does not have any potatoes. Pemba’s recipe included one ingredient which I have not used in this way before – dark soy sauce. I don’t eat meat any more but my husband and friends seemed to enjoy it. They all said it was great. I thought I would try the kulfi because this is something I make quite often myself and am familiar with different ways of making it. 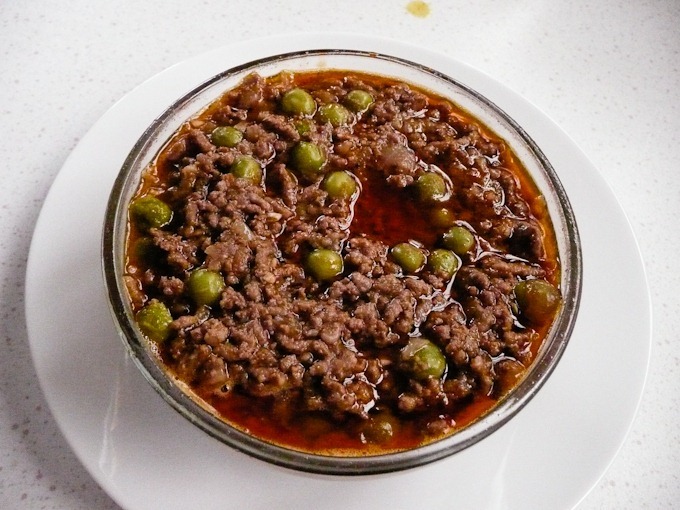 This one was made with tinned condensed milk and cream, instead of slowly simmering and condensing the milk at home over a long period. I will definitely make it again, but need to tweak it a bit. The recipe could have better instructions; it calls for “20 ml gelatine, melted” but doesn’t say how much powder/ leaf gelatine to use or how to melt gelatine. It says to “semi whip the cream” (singular), but doesn’t specify whether that’s the single and double cream together, or one or the other. 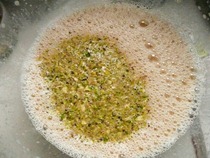 I whisked both the creams together and it seemed to work. I decided to make it without the mango, which the recipe mixes into the kulfee cream. I served it with raspberry coulis and fresh raspberries, but I made mine ‘sugar free. The result was soft and delicious. 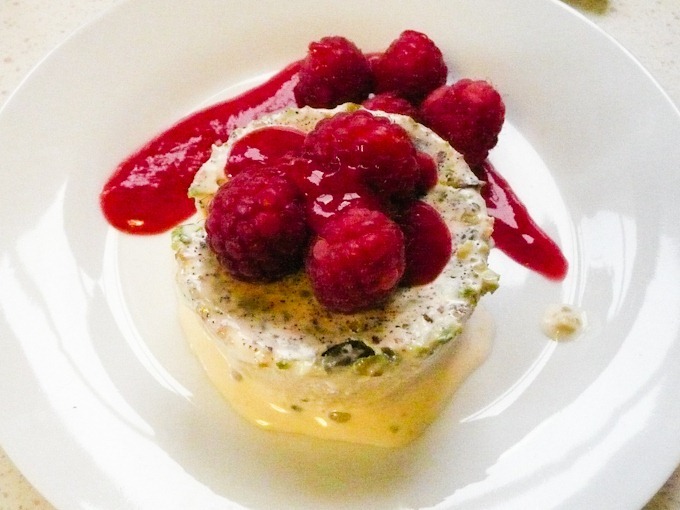 The book has a second dessert section written by Nicci Gurr, who was “invited to add a UK twist” to the book. Unfortunately I did not try any of her recipes. I would like to try some in due course., but being a diabetic, I have to control how many desserts I make. They all look good and I have no reason to think that the recipes in this section will not work. The book has a pleasant cover which makes a good first impression. The photos of Pemba lama are lovely, and you can’t help warming up to him. It’s obvious that he loves food and has shared some delicious dishes here. However, I get the impression that the recipes are not written by him, but by someone watching him cook. Some steps are not very clear and some are completely missing, which leaves you to interpret what is required by yourself and I think this would cause anxiety to a beginner. I think the book would work best for people who have some experience of this type of cooking, because some adjustments are needed here and there in several of the recipes. There are also minor errors, such as references to recipes on other pages, with incorrect page numbers given. 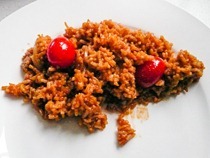 As with the Tomato Rice, there are a couple of recipes which have a wrong picture shown, such as a photograph of steamed broccoli with ginger and chilli for a recipe of curried potatoes and peas. The index is not complete. 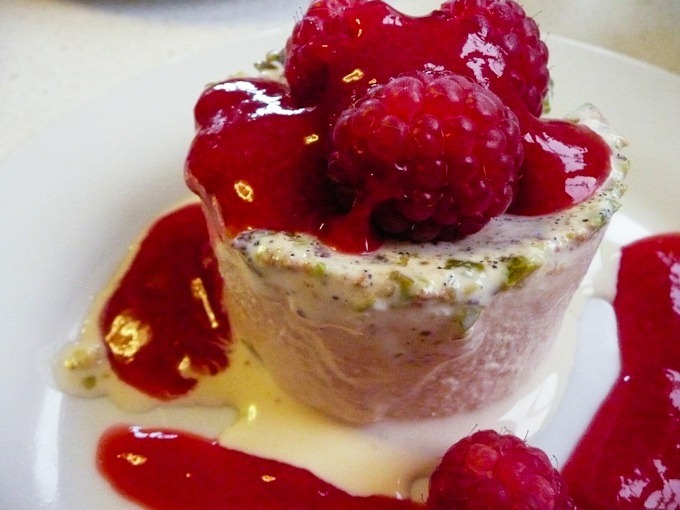 Searching for the cardamom kulfi recipe above, it is not listed under kulfi, cardamom or ice cream but under pistachio and raspberry. Despite these small issues, I loved the book and all the food I cooked from it. Definitely my kind of dishes. You can buy a softback copy of the book for £14.99 + £2 P&P or get the eBook version for £8. Click here or here to buy. 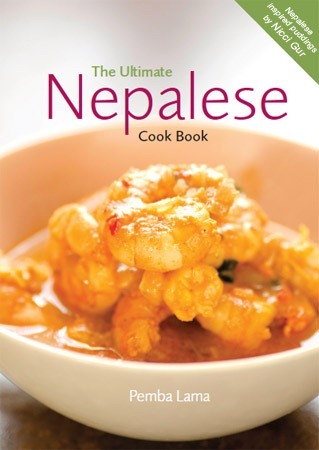 Kavey Eats was sent a review copy of The Ultimate Nepalese Cookbook by Grierson Publications. 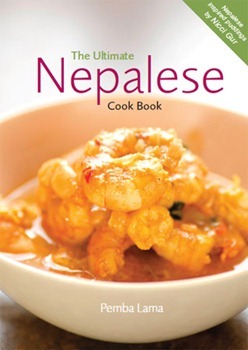 22 Comments to "The Ultimate Nepalese Cook Book"
Great post Kavey. Honest and insightful. I thought asking your mum to review the book was a great touch, and hey, any book signed by the Dalai Lamai has got to be worth a read. Thanks, yes mum brings a very different approach and experience of cooking to her reviews, thought it would fit this book really nicely. Just to clarify, the copy I got wasn’t signed by the Dalai Lama, of course. Am guessing Pemba Lama will keep that copy himself! Great review – it’s a shame that there are some little errors in the recipes etc, but it’s hard to be perfect, and the book probably doesn’t have a huge publishing house machine behind it. 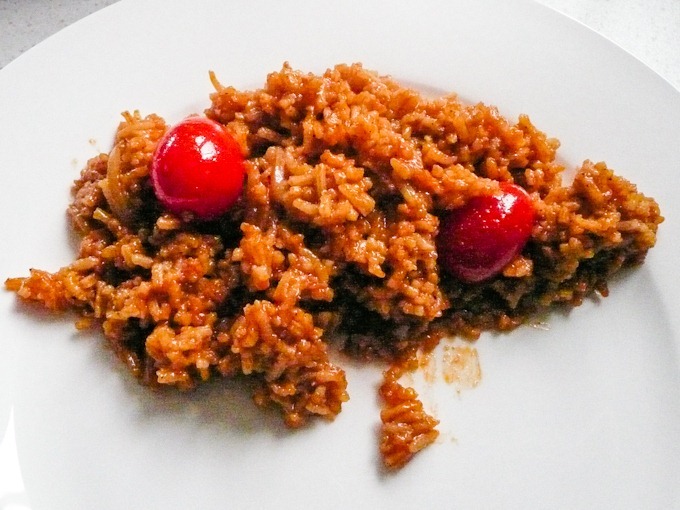 And the bit about needing to add water to the tomato juice – I do find that some Asian recipes written initially for an Asian audience, sometimes take the amount of water needed for rice as a given, as it is such a staple. I don’t suppose I would tell someone how much water I use to boil potatoes. Thanks for bringing the book to our attention Kavey. Yes, indeed, I think the publisher was set up specifically for this book so not a big organisation, I think. Sure they had a much smaller team and budget than the big cookbook publishers! You may be right on the water/ rice issue, interesting thought. There are other ambiguous or missing instructions though, so I’m not sure that’s it, but in any case, is a minor issue. I guess it will become a family heirloom in Pemba Lama’s house :-), kept with other holy books. What a lovely book and review and for such a good cause. I do not think I have ever had Nepalese food either, isn’t (wasn’t) there a restaurant just off Leicester Square once? I don’t know, I’ve never been to a Nepalese restaurant. Had a quick google and there seem to be many on the outskirts or just outside London, but only this one came up for me within London. As mum says, there’s a lot in common with Northern Indian food, but not 100%, of course. Thank you for a lovely and honest review of the book. Hi Kavey! Thank you so much for getting your mum to review the book – that was a great idea! I am the editor and publisher of the book and am very proud of it. I would like to emphasise to everyone that Pemba DID write every single recipe, and then rewrote and re-rewrote each one (apart from Nicci’s, of course!!) until we were happy. I take your mum’s point about water, and will definitely address for the reprint as well as the few indexing issues. I’d also like to say that the book has been put up for three awards at the Gourmand Awards in March next year, so we are very much hoping for huge success! Any other comments are really appreciated. Dear Annie, thank you so much for taking the time to visit the blog and read the review. I hope you enjoyed it, the minor niggles we fedback on notwithstanding. It’s good to know that Pemba wrote all the recipes, perhaps it’s just the case that as such a very experienced and instinctive cook, he forgets what new cooks or cooks unfamiliar with a cuisine may struggle with. In any case, the recipes came out well, with minor adjustments. Am wishing you best of luck at the Gourmand Awards and do hope that the world does indeed discover Nepalese food, given how popular Indian food is already, it’s surely the turn of some attention for Nepalese? Kavey, I know you visit Cornwall quite often. There’s a Nepalese restaurant in St Austell. We first went on a Saturday, and the service was atrocious, but the food was so good that we gave it another chance. The service was better on a less busy night. Why have I never heard of this book? my husband spent 7 years as an officer in the Gurkhas and did three treks in Nepal. I gave a group of Nepalese ladies a course in English cookery and I own a copy of the traning manual that was used at the time by Nepalese cooks in Gurhka messes – that book has my name written all over it! Yet you sneakily publ;ished your review on it while I was away on holiday – and I came home to so many unread blog posts I had to just leave then all unread and start from scratch again. Thank goodness you tweeted about it last night! Stumbled upon this book at a friends house , think I sussed him out ! Anyhow I managed to prize it off him for a few days and tried out some of the different dishes, well then my take on asian cuisine has dramatically changednow. Ive applied some minor changes in my cooking style and now my food is a definate crowd pleaser. With thanks to this fantastic book. Since then ive bought one and its my prize posession.